How did we get these yoga alignment cues? Questioning some of these long standing yoga cues is likely to challenge your beliefs about what is right and what is wrong in yoga. I try not to deal in absolutes when it comes to something as complex as the body and something as complex as yoga. Before you read further, remember that when we have heard anything for years and believe it to be true, it’s naturally difficult to hear challenges toward that belief. Somewhere back in the early days of teaching yoga asana, teachers began coming up with verbal cues and alignment ideas to send students in a particular direction in their yoga practice. Most likely, these cues came from their own deep experience of practice. We’ll give the first person to use each of those cues the benefit of the doubt that what they were suggesting was for a specific purpose in that moment. But, somewhere along the way, we’ve also started to play the yoga telephone game. 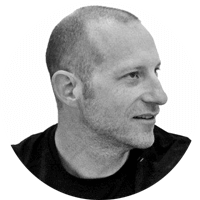 I travel all over the world and hear students repeat back to me verbal cues or alignment “rules” that they’ve heard from teachers without ever hearing any further explanation about the intention behind them. Some of them might be appropriate in some situations, but not a great idea in others. Some of them I disagree with most of the time. 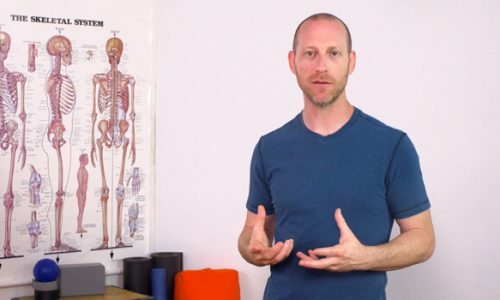 This is the first post in a new series of posts where I’ll dissect some of the most common “yoga alignment cues” from an anatomical perspective. In this series of articles I’ll take a look at some of those cues that I hear most often. 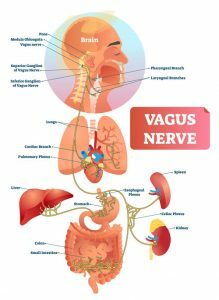 I’ll encourage you to think and explore a little more deeply about what the intention behind each of these cues might be and how we might convey that intention better in different situations. 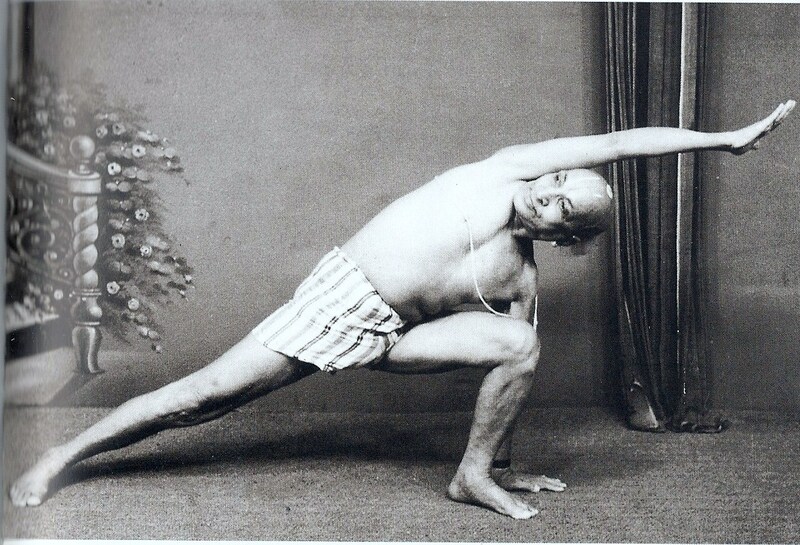 Myth #1: The knee should never go in front of the ankle in poses such as side angle, utkatasana, warrior 1, warrior 2, etc. Chances are, if you’ve been around the modern yoga studio for any length of time, you’ve heard this before. Maybe you’ve said it yourself, because that’s what they told you in teacher training, right? Maybe you even heard someone say that bringing the knee in front of the ankle in poses such as side angle or warrior 2 was very dangerous for the knee. But, did they ever follow that up and explain why? Before we get too deeply into dissecting this particular myth, let’s review the structure and function of the knee joint. The knee could be considered to include two joints, the femorotibial joint where the femur (thigh bone) meets the tibia (larger of the two lower leg bones), and the patellofemoral joint, where the patella (kneecap) meets the femur. The first joint, the femorotibial joint is the one that we’re usually thinking about when we refer to the knee joint. It’s that joint that does the action of bringing the lower leg either closer or farther from the thigh, and it is that joint which is primarily responsible for the weight-bearing aspect of the knee joint when we pick up a heavy object and move with it. When is the knee joint vulnerable? The knee joint can be vulnerable because it is between two long levers. This means that it can generate more force with less effort. That cuts both ways. It makes the joint very efficient for activities like walking and running, but it also makes it more vulnerable because force can be directed into the knee from either above or below. Its design also allows for considerable mobility. We’re likely familiar with the flexion and extension actions of the knee joint, but when the knee is in a flexed position, it can also rotate, both internally and externally. All of this is normal, healthy movement of the joint. In a knee joint that is moving straight forward and backward, we are weight-bearing through the center of the knee joint and through the center of the ankle joint below it. In this case we can flex and extend the knee through whatever the range of motion is that the flexibility and strength of our muscles allow. So yes, provided that you have the strength and flexibility to do so, and that it does not cause pain for some other reason, bringing the knee in front of the ankle in poses such as side angle, warrior 2, or utkatasana will be fine for most people. It’s normal movement. Notice that your knee goes in front of your ankle every time you walk up a flight of stairs or go for a hike uphill. 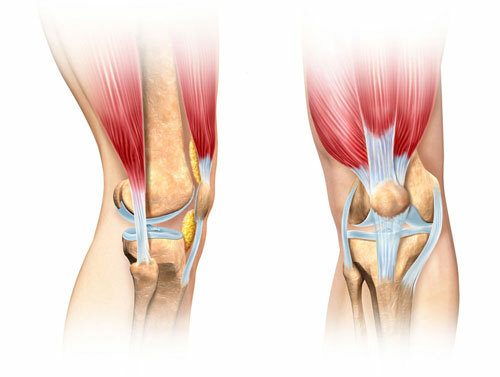 A system of muscles and ligaments around the knee joint contributes to the stability of the joint, particularly when no rotation of the joint is happening. But, when force from either of the two levers is directed towards the knee joint and it is flexed, extended, or rotated past where the muscles and ligaments can stabilize it, then the knee is vulnerable to injury. When should we be concerned about the knee joint? The knees can be vulnerable when flexed in poses such as side angle, utkatasana, warrior 1, etc., but not necessarily in the way you might think. When the knee is flexed to 90° (90° starting from anatomical position), the greatest amount of internal and external rotation is possible. If the knee is rotated either internally or externally, then the line of weight-bearing is no longer going straight through the centerline of the knee. In poses when one leg is bent in front, such as side angle or warrior 2, it is common for our front knee to want to “fall in” or internally rotate a bit due to tension around the hips that is transferred into the knee joint through the kinetic chain of joints. If the knee internally rotates and we transfer force into it because our hips are tight, we can potentially put more pressure on the inside of the knee than the ligaments and muscles can resist. Because we do have ligaments in place that have the job of preventing the knee from going too far in any direction, a single movement out of the ideal knee track may not be a problem. However, repeated movements that add stress to the inside or outside of the knee joint over time, could be more concerning. If taking the knee in front of the ankle in warrior pose is a normal range of motion, then why does my knee hurt sometimes in warrior? 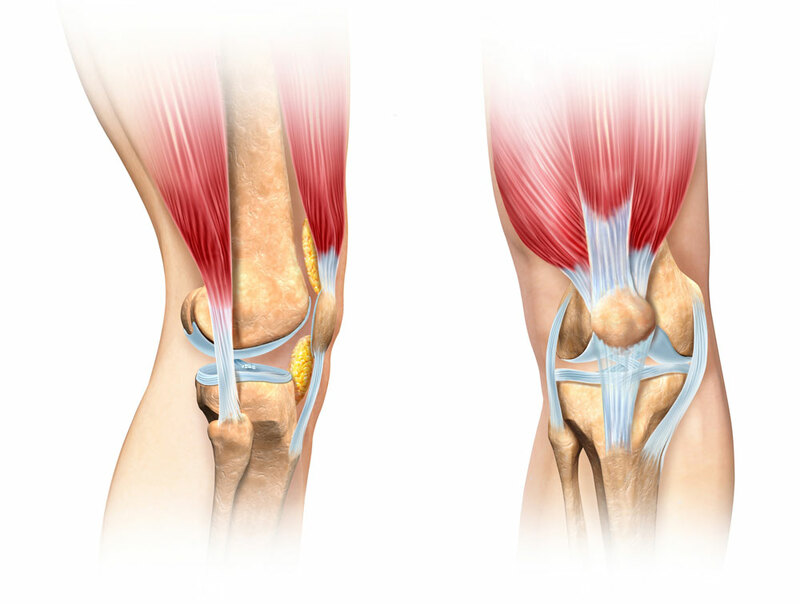 We have four quadriceps muscles on the front of the thigh, all of which form a common tendon at their end closest to the knee, which then wraps over the knee and attaches to the front of the lower leg. An imbalance in quadriceps strength between the medial (inside) and lateral (outside) quadriceps muscles can alter the position of the patella (kneecap) and increase tension on the inside or outside of the knee joint. A general tightness in all the quadriceps can also restrict knee flexion and limit how far it feels comfortable to flex the knee. This is especially true when we are weight-bearing as in poses like side angle or warrior 2, where the quadriceps are eccentrically contracting to take us into the posture and contracting isometrically to hold us in the pose. If you feel pain or intense discomfort in a knee when you are doing side angle or warrior 2, back out of the pose to a place where it feels okay. Just don’t go as far. As your quadriceps gain more strength and flexibility over time, you can perhaps go a little farther. 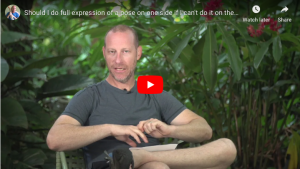 Rather than holding onto any one “rule” about the alignment of the knee, consider the student doing the pose, what their body strengths and issues are, and consider the intention of the pose. For instance, a beginner holding one of these postures for too long could have trouble, because they don’t have the strength to hold this position for as long as students who have been practicing for many years. Remember that a knee going straight forward and backward can bear more weight safely than a rotated knee. Pay attention to the direction the knees are moving and adjust the depth of the posture based on how easy or difficult it is to maintain a straight forward and backward movement at the knee. It’s important to remember that yoga asana is a tool. Just as there are ways to more or less efficiently use most tools, a hammer or a wrench for example, there is also variation from person to person. The same is true of yoga asana. If our yoga asana tool is going to be at its most effective, then we need to be aware of who is applying the tool and what is best in their particular situation. If there is one thing that I want you to take away from this series of posts, it’s that every single person who is doing yoga asana practice is experiencing what is true for their body. While some general guidelines are useful for teaching yoga, a better question to ask is: what is the most appropriate option for this student in front of me right now (or for yourself if you are reading this with respect to your own practice)? Better than memorizing some arbitrary “alignment rules”, which won’t apply to everyone, is learning more about how the body moves or resists movement, so you can make informed decisions about your own practice and/or offer informed direction to your students for each of their individual practices. Chaitow, L. and J. Delaney. 2012. The Knee. In: Clinical Application of Neuromuscular Techniques – Volume 2, The Lower Body. Elsevier Ltd., New York.